You’ll feel like family at Thrive Chiropractic! When you arrive, you’ll be greeted by our warm, friendly team. We’re here to help you and your family thrive, and we look forward to getting started. At Thrive Chiropractic, we welcome everyone to take advantage of our complimentary consultation. You will have the opportunity to learn about what makes us unique, have your questions answered, and determine if our practice is the right fit for your goals. This consultation is truly a conversation, not a commitment. Our tonal examination utilizes state-of-the-art technology to evaluate your spine and nervous system and uncover the cause of your health condition. At the conclusion of the exam we will know if a tonal shift is present and if our office is the right fit for your condition and your goals. 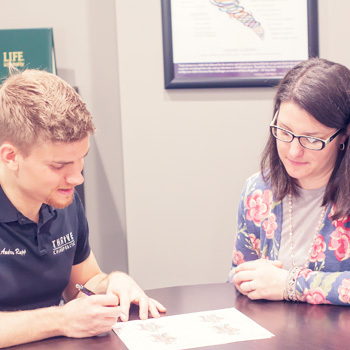 At this meeting we will present our customized recommendations and care plan based on your exam findings and case history, after which you will have the opportunity to receive your first tonal chiropractic adjustment. To schedule your first visit, call our office. We’re excited to help you and your family!